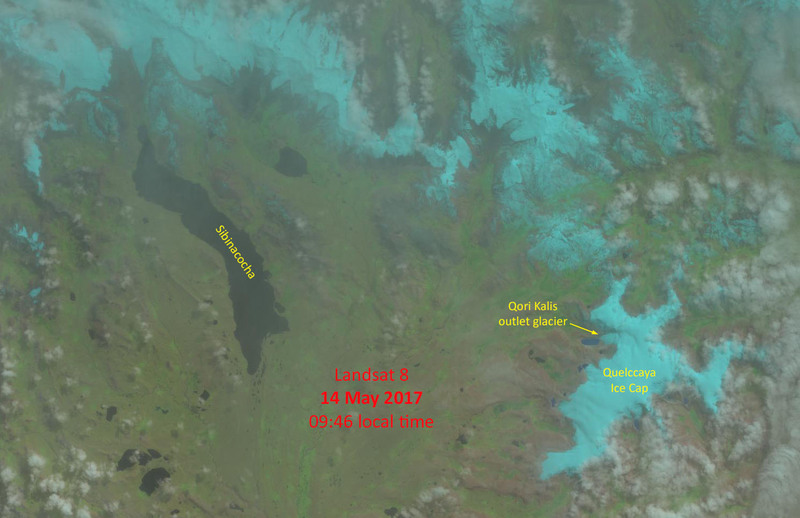 The current accumulation season began ~8 months ago, almost immediately after a Landsat image was acquired on 16 September. Last year was thus an atypical situation in which the ELA can be known with some confidence, which for 2016 was ~5600 m.
Excepting the first half of November, accumulation steadily increased into early April. Although the rate of accumulation then decreased, telemetry reveals that snowfall continues, as illustrated by the image above - depicting the area yesterday through high clouds. 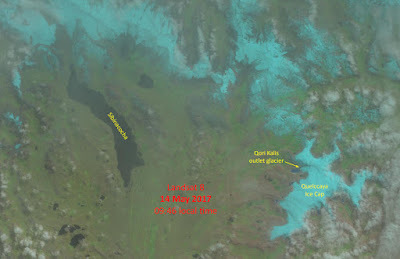 Note that fresh snow is visible on the landscape even at elevations below the glaciers. Since the mid-September minimum, 2.05 m of snow has accumulated at the AWS.